Alle Studierenden, die sich für einen künftigen Lehrenden aus dem Bereich Computergrafik und Computer Vision interessieren, sind herzlich eingeladen, vorbei zu schauen. Der Vortrag wird auf Englisch abgehalten. Mapping from data tables to visual abstraction is a crucial step in the visualization pipeline. It often determines if a visualization will be successful or not. Basic visual structures: points, lines, shapes, and color are combined into more complex visual representations. 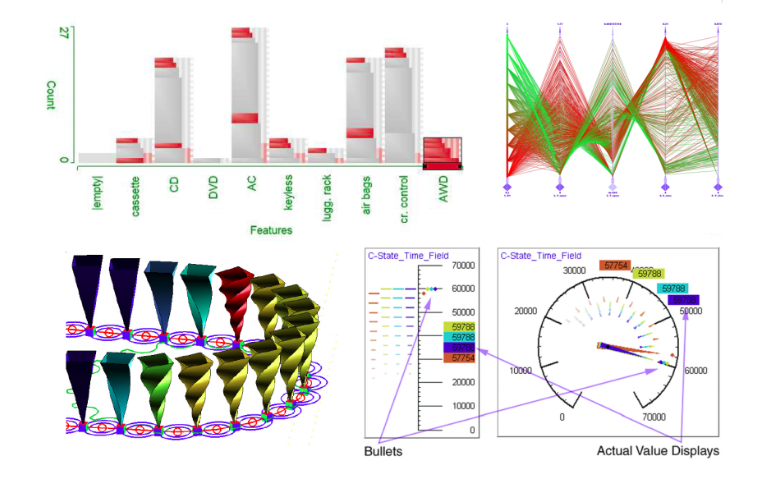 We explain standard representations for 1D, 2D, 3d, and nD data, such as, histogram, box-plot, pie-chart, scatter-plot, or parallel coordinates, for example. Further, we provide guidelines how to use them and explain how not use certain visual structures. Problems of using 2D or 3D structures to depict 1D data, or the problem of line-width illusion are also explained. The students should gain basic understanding of the importance of the visual-mapping step in the visualization pipeline, and they should be able to choose right visualization, and to recognize misleading visualization. The talk will be held in English and is part of Mr Matkovic's habilitation process. All interested students and personnel are invited to attend the talk.